Forbes magazine has just released their ‘Powerful People List’ for 2015; and one of the most remarkable ascents has been of PM Modi, who has climbed 6 spots to become world’s 9th most powerful person. Last year, he was ranked #15 in this list. Describing PM Modi’s achievements, Forbes said that “governing 1.2 billion people requires more than shaking hands..”. PM Modi has successfully achieved a growth of 7.4% in India’s GDP during the first year itself, meanwhile luring investors from Silicon Valley and China at the same time. PM Modi has already debuted at Bloomberg Markets Power List, where he was ranked as 13th most influential person. The only Indian other than PM Modi on this power list is Reliance Industries Chairman and MD Mukesh Ambani, who has maintained his #36 rank. Russian President Vladimir Putin has maintained his #1 position to remain World’s most powerful person, meanwhile US President Barrack Obama has slipped one rank to be placed at #3. German Chancellor Angela Merkel is now placed at #2, as she climbed 3 spots from last year’s ranking. Xi Jinping, General Secretary of the Communist Party of China & President of China, has slipped 2 positions in this list, to #5 this year, while Pope Francis maintained his #4 rank. Software billionaire Bill Gates has improved his position to become #6 most powerful person on Earth. Following PM Modi is Google co-founder Larry Page, who is ranked #10 this year, slipped one position compared to last year. – Li Ka-shing, aged 87 years, is the oldest person on this power list. He is a Hong Kong based business magnate, investor, and philanthropist and often called as Asia’s richest person having net worth of $32 billion. He is ranked 31 on Forbes’ list. – Warren Buffet, aged 85 years, is the second oldest person on this list on #13, while Rupert Murdoch, aged 84 years, is the 3rd oldest person on this list. He is ranked #35. 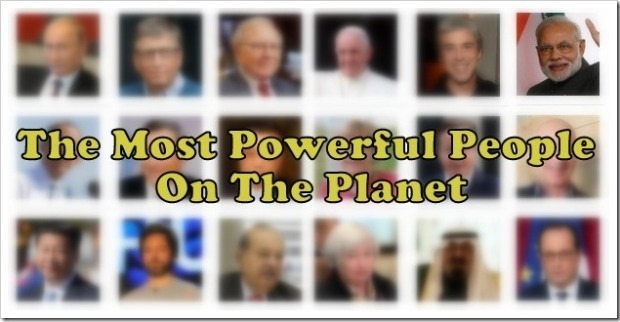 You can get the complete ranking of Forbes’ The World’s Most Powerful People here. Here is the last year’s ranking. "PM Modi Is World’s 9th Most Powerful Person; Climbs 6 Spots In Forbes' 'Powerful People' List for 2015", 5 out of 5 based on 3 ratings.